I’ve been doing some dreaming about what our master bedroom should look like ever since we moved into our new house, and man, the decisions are so difficult! I want our new bedroom to be a place of relaxation and rejuvenation, but also something that is stylish and cohesive. I’ve been scouring the web for pieces that I like and that would complement the room. I already have the bedframe and the sheets and pillows that are pictured here, so I wanted to find something that would work well with what I already have. I love mustard yellow, gray, and different textures, so I also wanted to incorporate those into the room. Keep in mind, that things aren’t to scale, or aren’t the exact color, since all online photos are different. Also keep in mind that there will be much more in the room than the pieces featured here! 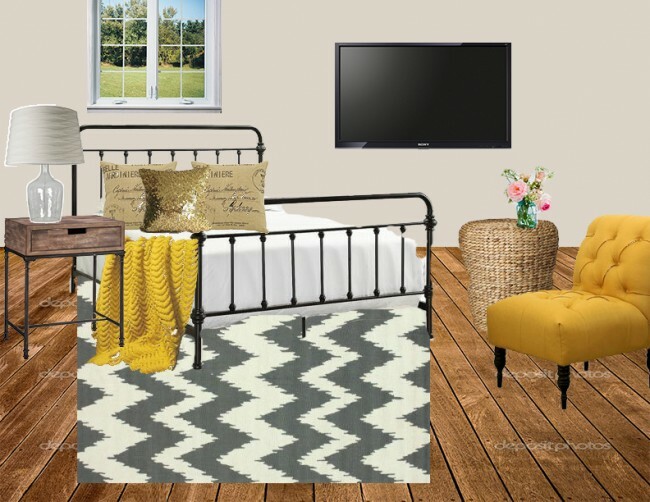 This is only a photoshop compilation master bedroom styleboard, after all 😉 After much research and debate, these are some of the things I’m settling on tentatively to add to our room. What do you guys think? Do you like my choices? Let me know in the comments below!